Frank Jackson, a Mormon and 2016 college basketball recruit, is considering taking a mission before his college career begins. 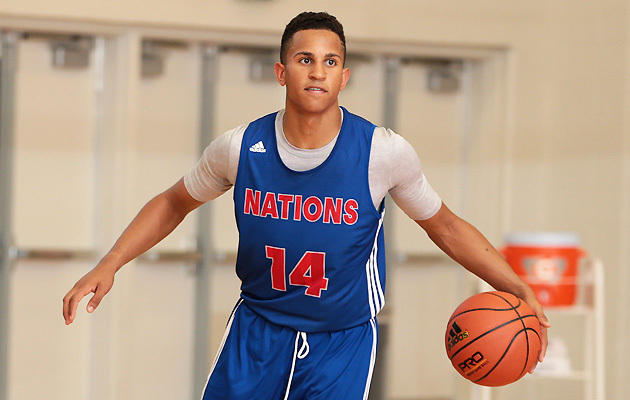 Frank Jackson is considered one of the best guards in the class of 2016, but it may be more appropriate to think of him as part of the class of 2018. A member of The Church of Jesus Christ of Latter-day Saints, he plans to serve a mission after graduating from Lone Peak (Utah) High School next year. That would delay the beginning of his college career two years, meaning he would not play his first game until he is 20 years old. “It’s something I’ve always wanted to do,” Jackson says of serving a mission. Before the 6'4", 185-pound Jackson blossomed into a national recruit, it appeared he would attend a school owned by the LDS church. Jackson grew up in the Washington D.C. area before moving to Oregon and then Utah. He visited the latter state—where his family kept a summer house—and attended BYU basketball camps for the first time about five years ago; he also has a 20-year-old sister who attends the school and is on a mission in Peru. BYU and Utah reached out to Jackson the summer after his freshman year at Lehi (Utah) High, during which he flashed his potential by dropping 30 points in a game against Lone Peak. “That’s when everything kind of blew up,” Jackson says. It didn’t take long for Jackson to garner attention from other programs. He moved to Highland, Utah, before his sophomore season and transferred to Lone Peak High, where he averaged nearly 18 points while helping the Knights win their fourth consecutive state championship in 2014. Jackson continued to impress at a tournament in Dubai that summer, and then received an invitation to the prestigious CP3 Elite Guard Camp. At the camp, Jackson said he heard other players discussing with each other how they were being recruited by big-time programs such as Connecticut, Duke, Georgetown and North Carolina. Those conversations factored into his decision to reconsider his commitment to BYU. “I was kinda sitting back like, ‘I can compete with all these kids. Why can’t I get the attention they’re getting? Why can’t I get those offers that they’re getting?’” Jackson says. Jackson’s decommitment was not reported until last November, but other schools had indirectly expressed interest in him before that. Arizona State and Utah were among the first to reach out to him, and Jackson continued to draw interest from other schools during his junior season at Lone Peak, which included a 54-point game at a tournament in Las Vegas. Jackson has drawn more attention this spring. Over eight games on the Adidas Uprising Gauntlet in Indianapolis and Dallas, he has averaged 23.5 points, 3.9 rebounds and 2.8 assists while shooting 56.2% from the field, 42.5% from three-point range and posting a 24.9 Player Efficiency Rating. He said he holds offers from Gonzaga, UCLA and Utah, among other programs, and plans to take visits to Arizona, Duke, Maryland and North Carolina this summer. Throughout his recruitment, Jackson says he has spoken with other players who have served missions, including BYU standout Tyler Haws and his brother, T.J., a teammate at Lone Peak and four-star guard in the class of 2014. Another player Jackson would like to speak with is Milwaukee Bucks forward Jabari Parker. A member of the LDS church and Rivals.com's No. 4 recruit in the class of 2013, Parker included BYU on his final list of five schools before ultimately choosing Duke; he elected not to serve a mission. The likelihood that he’ll need some time to get back up to speed on the court has not and likely will not prevent schools from pursuing Jackson intently. “Every school I’ve talked to is cool to let me go serve for two years, then come back and play,” Jackson says. • Washington has lost four players to transfer since the end of last season. Then last week, one of the program’s top recruits, point guard JaQuori McLaughlin, announced he was backing away from his commitment. He hopes to take several visits before signing his National Letter of Intent with a school later this year. McLaughlin initially committed to Oregon State but reopened his recruitment after the school fired former coach Craig Robinson. He then pledged to the Huskies in late November before decommitting last week. His father, Jay, told The Seattle Times that McLaughlin has not ruled out Washington and that he’s “99.9% sure” JaQuori will pick a Pac-12 school. McLaughin is the second prospect in the class of 2016 to renounce his commitment to the Huskies. In November, reports said four-star point guard Jermaine Haley would reopen his recruitment. Washington recently signed 2016 center Sam Timmins, a native of New Zealand. • Kentucky missed on a slew of five-star prospects in the class of 2015, but could the Wildcats be on the verge of adding an elite recruit? Jamal Murray was on an official visit to Lexington, Ky., earlier this week, according to multiple reports. Murray is currently classified as a member of the class of 2016—Rivals.com ranks him the No. 15 player in that class—but he reportedly has been considering a move to 2015. Murray, who attends Orangeville Prep in Ontario, impressed schools with his performance at the Nike Hoop Summit last month, scoring 30 points and dishing out five assists to help the World Team edge Team USA. If the 6'5" point guard decides against playing college basketball, he could conceivably remain in prep school for another season before entering the NBA draft. • Shaquille O’Neal’s son, Shareef, announced last week that he has received his first scholarship offer, from USC. A freshman at the Los Angeles (Calif.) Windward School, O’Neal averaged 3.7 points and 2.9 rebounds per game last season. A mixtape of the 6'8"’ forward released earlier this month already has been viewed more than 4.6 million times. • About two weeks after he decommitted from SMU, LaGerald Vick has settled on a new school. He pledged to Kansas on Sunday after visiting Lawrence last week. Vick’s AAU coach told The Kansas City Star that it’s not certain whether Vick will join the Jayhawks this season or next season, but he could potentially add to a 2015 recruiting class that already includes five-star prospects Carlton Bragg and Cheick Diallo. Vick, who also drew scholarship offers from Kentucky, Ole Miss and Tennessee, among other programs, attends Douglass (Tenn.) High. When he committed to SMU last October, Vick reclassified from the class of 2015 to 2016, and reportedly intended to spend a year at a prep school before beginning his college basketball career. Now Vick looks set to reverse that move. • West Virginia announced this week that it has signed Lamont West. The 6'8", 205-pound forward, who also drew scholarship offers from Arkansas and Tennessee, among other programs, averaged 15.8 points, 7.7 rebounds and 2.6 blocks per game while shooting 59% from the field last season at Miller Grove (Ga.) High, according to MaxPreps. West Virginia’s 2015 recruiting class also includes four-star power forward Esa Ahmad, three-star point guard James Bolden and three-star shooting guard Teyvon Myers. • South Carolina added a fifth member to its 2015 recruiting class when three-star power forward Eric Cobb, who decommitted from Kansas State in April, pledged to the Gamecocks. He joins three-star signees Chris Silva, Jamall Gregory and four-star shooting P.J. Dozier, a McDonald’s All-American and the No. 37 player in the class of 2015. The Gamecocks also have received a commitment from three-star center Travon Bunch. Cobb, who chose South Carolina over scholarship offers from Seton Hall and VCU, among other programs, averaged 6.7 points and 7.4 rebounds per game at St. Frances (Md.) Academy last season, according to MaxPreps. • Less than three months after renouncing his commitment to Penn State, Joe Hampton pledged to the Nittany Lions again. Hampton, who first committed to Penn State in August, is the No. 114 player in the class of 2016. The 6'7", 247-pound power forward chose the Nittany Lions over Xavier and Virginia Tech, among other programs. His teammate at Oak Hill (Va.) Academy, three-star shooting guard Josh Reaves, will join Penn State as part of its 2015 recruiting class. The Nittany Lions’ 2016 class also includes three-star shooting guard Nazeer Bostick. • Jordan Murphy was one of three players who signed a National Letter of Intent with VCU, only to ask for a release when former coach Shaka Smart left to take the same position at Texas. Guard Kenny Williams chose North Carolina, wing Tevin Mack picked Texas and Murphy, a 6'7" small forward, last week committed to Minnesota. Murphy, the No. 113 player in the class of 2015, averaged 23.6 points, 10.5 rebounds and 3.1 assists per game at William J. Brennan (Texas) High last season, according to MaxPreps. He becomes the seventh member of the Gophers’ 2015 recruiting class. Minnesota is also set to add four-star point guard Kevin Dorsey, three-star prospects Ahmad Gilbert, Jarvis Johnson, Dupree McBrayer, Jonathan Nwankwo and Illinois State transfer Reggie Lynch. • Five-star prospects and Team Loaded (N.C.) teammates Dennis Smith and Edrice “Bam” Adebayo connected for an impressive alley-oop at the Southern Jam Fest in Hampton, Va., last weekend. • Marquette earned its first commitment from a player in the 2016 class. Sam Hauser, a three-star small forward who attends Stevens Point (Wisc.) High, announced on Sunday that he has pledged to the Golden Eagles. He also garnered scholarship offers from Creighton, Iowa State and Virginia, among other programs. Last season Hauser averaged 18.0 points, 7.6 rebounds and 3.4 assists per game while shooting 52.1% from three-point range. Though Hauser won’t join Marquette until next season, the school’s 2015 recruiting class features five-star power forward Henry Ellenson and four-star prospects Traci Carter and Haanif Cheatham. • Lucas Siewert decommitted from Arizona State. Siewert pledged to the Sun Devils in January, under former coach Herb Sendek, but the school fired him in March and tabbed Bobby Hurley as his replacement. As a junior at Cathedral (Calif.) High last season, Siewert, a native of Brazil, averaged 11.1 points and 6.7 rebounds per game while shooting 37% from three-point range, according to MaxPreps. Arizona State also reportedly had two of its other class of 2016 recruits, point guard Lindsey Drew and small forward Brendan Bailey, reopen their recruitments in March. In addition, 2017 standout Markus Howard backed off his pledge to the Sun Devils.